New and Green Blog | Cloth Diapers and Accessories! Looking for a natural fiber, reusable cloth diaper liner? Well, look no more! Hemp Babies Raw Silk Liner (by cottonbabies) has natural anti-bacterial properties that may keep yeast and diaper rash at bay. Silk is the only 100% natural wicking material able to help keep baby’s skin drier. This entry was posted in Products and tagged cloth diaper liners, cloth diapers, Hemp Babies, Hemp Babies Raw Silk Liner on September 30, 2014 by New & Green. Cloth diapers and wool covers are a great pairing! While you don’t need to wash your woolies after each use, you will have to lanolize them every once in awhile. 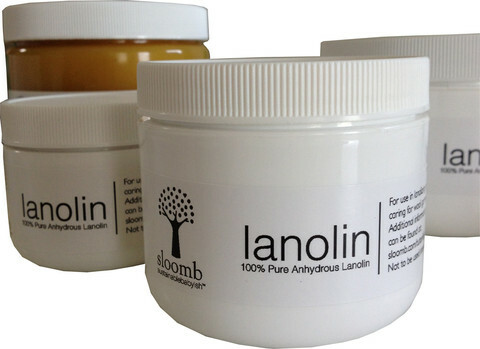 sloomb Solid Lanolin is smooth and thick. It effectively lanolizes your woolies easily and a little goes a long way. sloomb lanolin is 100% pure USP pharmaceutical grade solid lanolin with no additives or preservatives. It has very little natural scent and you could use it with a scented wool wash to make your woolies smell joyous and less sheepy. 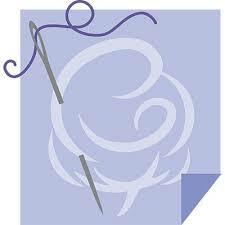 This entry was posted in Products, Washing Cloth Diapers and tagged cloth diapers, lanolin, lanolizing wool, sloomb, sloomb solid lanolin, wool covers, woolies on September 10, 2014 by New & Green. Rockin’ Green Shake it up! Rockin’ Green Shake it up! 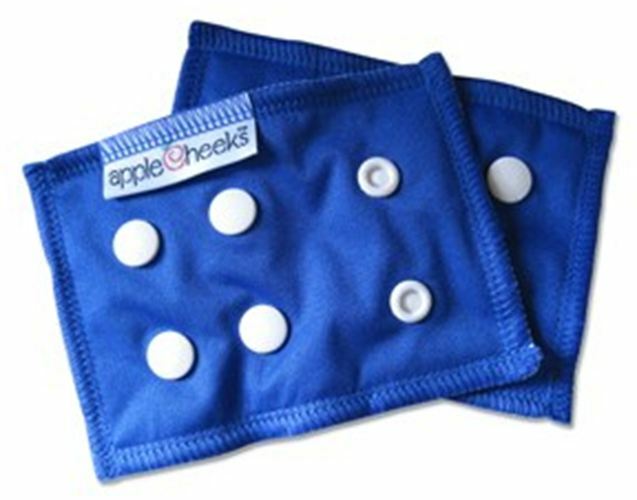 Diaper Pail Freshener is all natural and a great way to avoid the stinky smell cloth diaper pails and wet bags may get. You get 8 ounces of freshner in an ultra-cool shaker bottle. 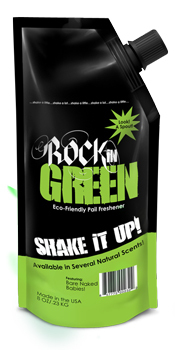 It works great in conjunction with the Rockin’ Green detergent, and is available in the same fabulous scents – Smashing Watermelons, Motley Clean and Lavender Mint Revival. So use both to keep your cloth diapers and home smelling AMAZING! This entry was posted in Products and tagged cloth diapers, pail freshener, Rockin Green, Rockin' Green detergent, Shake it up! on September 3, 2014 by New & Green. This entry was posted in Leaking Cloth Diapers, Products and tagged bumGenius, bumGenius refresher kit, cloth diapers on September 2, 2014 by New & Green. 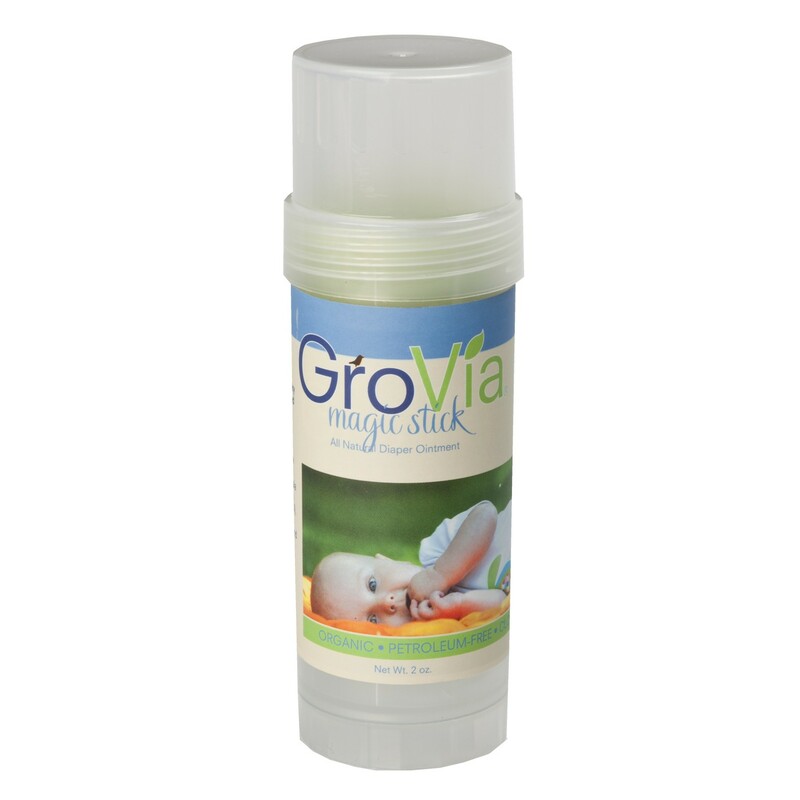 The GroVia Magic Stick is made from natural ingredients and is cloth diaper safe. 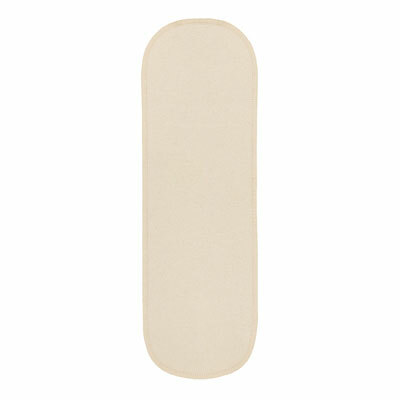 It protects baby’s sensitive skin from wetness and helps clear up minor rashes. The unique format allows your hands to be mess-free and lets you apply the perfect amount. Since it is mess-free, the GroVia Magic Stick is a great addition to your diaper bag. This entry was posted in Products and tagged cloth diapers, cloth safe diaper cream, diaper rash, grovia, GroVia Magic Stick on August 29, 2014 by New & Green. Are your beloved AppleCheeks Envelope Covers starting to be too snug? Extend your use of these fabulously trim covers by using AppleCheeks Waist Extenders. These extenders allow you to get approximately 2 extra inches of life out of your fave Applecheeks Envelope Covers. This entry was posted in Products and tagged AppleCheeks, AppleCheeks Envelope Cover, AppleCheeks Waist Extenders, cloth diapers on August 28, 2014 by New & Green. 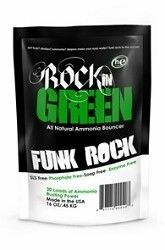 Rockin’ Green Funk Rock Ammonia Bouncer is a 100% natural compound and is unlike anything you have tried before. It targets funk at the source and leaves no prisoners. Just 4 tablespoons is enough to de-funk up to 20 cloth diapers in one sitting. A little to your pre-wash to keep the stinkies from coming back. That’s right, this little 16oz bag will keep the cloth diaper funk away for over 2 months! This entry was posted in Products, Washing Cloth Diapers and tagged ammonia build up, cloth diapers, Funk Rock Ammonia Bouncer, Rockin Green on August 27, 2014 by New & Green. 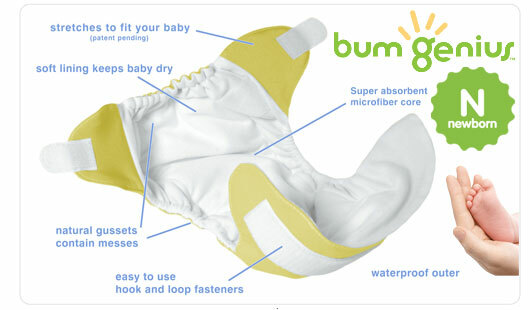 The bumgenius Newborn cloth diaper is so cute and itty bitty. This all-in-one cloth diaper has stretchy tabs and hook and loop closure making it just as easy as a disposable. It fits low, below the navel to keep the umbilical area dry and has super absorbent microfiber terry inside, which also allows the cloth diaper to dry quickly. This entry was posted in Newborns, Products and tagged bumGenius, bumGenius newborn cloth diaper, cloth diaper, newborn cloth diaper on August 26, 2014 by New & Green. 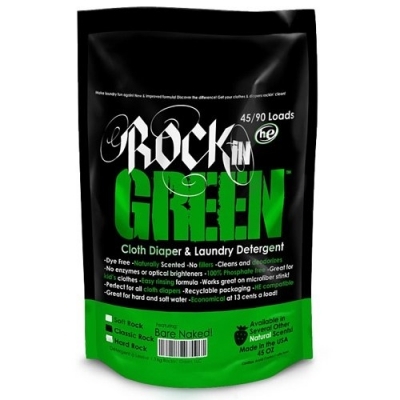 Rockin’ Green Detergent has been designed specifically for cloth diaper users – to get your diapers clean, leave no residue and work especially well in specific water conditions. Classic Rock: This formula is designed for those with middle of the road water, not too soft and not too hard. When in doubt start with classic rock! Hard Rock: This hard water formula is perfect for those that struggle with the toughest of water types! 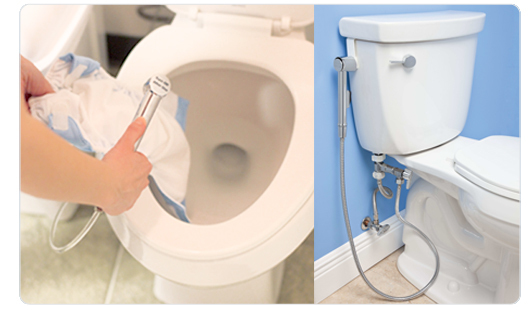 Soft Rock: Designed for those with soft water (or a water softener), this formula is just the right mix of gentle cleaners to get the job done with less rinsing. Smashing Watermelons – this juicy watermelon blend is like a kick to your senses…Best Seller! Motley Clean – This fresh blend has hints of ocean, fresh linen, and sunshine. Lavender Mint Revival – this medley of lavender and mint is like nothing you have smelled before! This entry was posted in Products, Washing Cloth Diapers and tagged bare naked babies, classic rock, cloth diapers, hard rock, lavender mint revival, motley clean, Rockin Green, Rockin' Green detergent, smashing watermelons, soft rock on August 21, 2014 by New & Green.